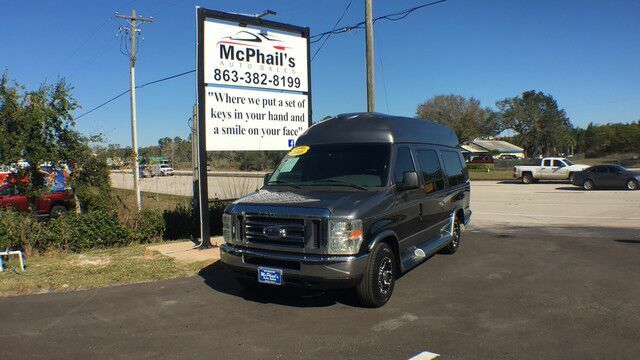 This 2008 Ford E-350 Diesel High Top 12 Pass Van Custom Tuscany Conversion is proudly offered by Mcphail's Auto Sales Your buying risks are reduced thanks to a CARFAX BuyBack Guarantee. With CARFAX one owner report you can be sure that this Ford E-350 Diesel High Top 12 Pass Van was only gently owned. This 2008 Ford E-350 Diesel High Top 12 Pass Van has such low mileage it has been parked more than driven. Adjectives like impeccable, spotless, and immaculate can be used to describe how clean this Ford E-350 Diesel High Top 12 Pass Van Custom Tuscany Conversion is, causing it to feel more like a new vehicle than a pre-owned one. Intricately stitched leather and ergonomic design seats are among the details in which test drivers say that Ford E-350 Diesel High Top 12 Pass Van is in a league of its own This Ford E-350 Diesel High Top 12 Pass Van comes equipped with hard-to-find custom wheels. This 2006 Ford Econoline E350 Cargo Van is proudly offered by Mcphail's Auto Sales HANDICAP LIFT EQUIP CARFAX BuyBack Guarantee is reassurance that any major issues with this vehicle will show on CARFAX report. This wonderfully maintained Ford Econoline E350 is in the top 10% of its class when it comes to cleanliness and condition. This extremely hard to find Ford Econoline E350 has made its way into our dealership. Beautiful color combination with Black exterior over Medium Flint interior making this the one to own!